Valuation analysts (“analysts”) and independent financial advisers (“advisers”) are often asked to opine on transactions involving an employee stock ownership plan (“ESOP”) and the ESOP sponsor company stock. These transactions may include the purchase, sale, contribution, or other transfer of the sponsor company stock. In the case of a proposed stock purchase transaction, the ESOP may request an opinion that the ESOP trust is not paying more than adequate consideration for the sponsor company stock. In the case of a proposed stock sale transaction, the ESOP may request an opinion that the ESOP trustee is not receiving less than adequate consideration for the sponsor company stock. Accordingly, before approving the sponsor company stock transaction, the ESOP trustee (or any other ESOP fiduciary) may request an independent valuation opinion or an independent financial adviser transaction fairness opinion. This discussion presents a checklist of procedures that analysts and advisers may consider in developing their transactional analyses and in reporting their transaction opinions. This checklist includes both business valuation procedures that analysts may consider in performing the stock valuation and due diligence procedures that advisers may consider in preparing the transaction fairness opinion. The original version of this discussion was published in the spring 1996 issue of Insights under the title “ESOP Valuation and Financial Advisory Due Diligence Checklist.” Robert F. Reilly, CPA, and Steven D. Garber were the authors of the original discussion. Valuation analysts and independent financial advisers are often asked to opine on stock purchase or sale transactions (potential or pending) involving an employee stock ownership plan (“ESOP”) and an ESOP sponsor company. This discussion focuses on the role of the independent financial adviser in (1) identifying successful sponsor company candidates for a potential ESOP formation, (2) performing an ESOP formation financial feasibility analysis, and (3) preparing an ESOP sponsor company stock purchase (or sale) transaction fairness opinion. This discussion is primarily presented from the perspective of the financial adviser to the ESOP trustee. This discussion is intended to provide guidance (1) to closely held company owners who are considering an ESOP formation and a stock sale transaction and (2) to legal, accounting, trustee, and other ESOP professionals who may be evaluating an ESOP sponsor company stock purchase or sale transaction. The original version of this discussion was published in the Autumn 2005 issue of Insights under the title “The Role of the Independent Financial Adviser in the ESOP Feasibility, Formation, and Transaction Fairness Process.” Malcolm B. Hartman was the author of the original discussion. Valuation analysts (“analysts”) are often asked to value closely held businesses and business ownership interests (including debt and equity securities) for federal gift tax, estate tax, and generation-skipping transfer tax purposes. These business-related valuation analyses may be performed for tax planning, tax compliance, and/or tax controversy purposes. In the process of conducting the business valuation analysis, analysts often have to apply valuation adjustments to preliminary value indications—in order to reach final value conclusions and opinions. The type of—and the magnitude of—these valuation adjustments may vary depending upon which generally accepted business valuation approaches and methods the analyst applied as part of the business valuation process. As will be summarized in this discussion, there are many types of valuation adjustments that the analyst may have to consider. Typically, all of these valuation adjustments can be grouped into one of two categories: systematic adjustments and nonsystematic adjustments. Systematic and nonsystematic valuation adjustments can be either decremental (called valuation discounts) or incremental (called valuation premiums). Systematic adjustments are discounts or premiums that affect business and security valuations across the board—such as the so-called “level of value” adjustments. Nonsystematic adjustments are discounts or premiums that relate to an individual subject company or subject security—such as key customer dependence or specific buy/sell shareholder agreement transferability restrictions. This discussion explains the common procedures that analysts apply to identify the factors or conditions for a nonsystematic valuation adjustment in a business or security valuation performed for tax planning, compliance, or controversy purposes. This discussion explains the common procedures that analysts apply to quantify nonsystematic valuation adjustments. This discussion includes several simplified illustrative examples of business valuation adjustment analysis. And, finally, this discussion considers the appropriate sequencing of nonsystematic valuation adjustments in a business or security valuation performed for tax planning, compliance, or controversy purposes. 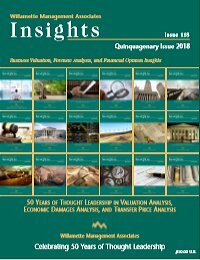 The original version of this discussion was published in the Special Issue 2006 issue of Insights under the title “Valuation Adjustments (Discounts and Premiums) in Business/Stock Valuations for Estate Planning or Estate Tax Purposes.” Trey Stevens was the author of the original discussion. Forensic accountants and other damages analysts (“analysts”) are often called on to perform consulting expert and testifying expert services with respect to commercial litigation disputes. In particular, those analysts are called on to measure the amount of damages suffered by the plaintiff in the dispute as a result of the wrongful actions of the defendant in the dispute. This discussion introduces the economic damages measurement methods that are typically applied by such analysts. This discussion focuses on the reasonable due diligence procedures that analyst perform related to such damages measurements. These due diligence procedures relate to the collection of—and assessment of—the data and the documents that the analyst relies on in the economic damages measurement process. A previous version of this discussion was published in the Spring 2013 issue of Insights. It was titled “Intangible Asset Economic Damages Due Diligence Procedures,” and it was originally authored by Robert F. Reilly, CPA. Valuation analysts (“analysts”) are often called on to measure economic damages in instances related to property deprivations. A property deprivation occurs whenever a property owner/operator is “deprived of” the ownership, operation, or economic enjoyment related to a property ownership interest. That property subject to the deprivation event could include tangible property or intangible property. For example, the tangible property subject to the deprivation event could include real estate and tangible personal property. The intangible property subject to the deprivation event could include a business ownership interest, an intangible asset or intellectual property, or a commercial contract right. The various types of property deprivation events could include a condemnation and eminent domain action, an international expropriation action, a tangible property or intangible property damages event, or intellectual property infringement, a dissenting shareholder appraisal rights or a shareholder oppression action, or a breach of a commercial contract. This discussion summarizes the many factors that analysts (and the tangible property or intangible property owner/operator and the legal counsel) should consider when measuring economic damages by reference to a deprivation event-related property valuation. The original version of this discussion was published in the Spring 1992 issue of Insights. That original discussion was titled “Valuation Standards regarding Deprivation Appraisals.” Robert F. Reilly, CPA, was the author of the original discussion. In commercial litigation matters, damages analysts (“analysts”) are often asked to identify the event that caused the claimants’ economic damages. The analysts are then asked to measure the amount of damages suffered by the claimants as a result of the wrongful event caused by the defendants. In litigation claims related to fraud against the marketplace or accounting fraud and misrepresentation, analysts often perform event studies to identify the damages event. In addition, analysts often use event studies in dissenting shareholder appraisal rights litigation claims. In cases involving the merger or acquisition of a public corporation, analysts may use an event study to test whether the efficient market hypothesis applies with regard to the subject public company’s stock price movements. This test is applied in order to determine whether the public company’s pre-announcement stock price is an appropriate starting point from which to estimate the fair value of the acquired company’s stock. In any event, this discussion summarizes the practical procedures that analysts should know when they use event tests to measure economic damages. The original version of this discussion was published in the Autumn 1999 issue of Insights under the title “The Use of Event Studies to Quantify Economic Damages.” Scott D. Levine, CPA, and Robert F. Reilly, CPA, were the authors of the original discussion. Many multistate corporations—particularly companies that operate in the retail and the services industries—may transfer certain intellectual property to an intellectual property holding company (“IPHC”). The function of the IPHC is to centralize, manage, protect, develop, and commercialize the corporation’s intellectual property. After the multistate corporation’s intellectual property is centralized in the IPHC, the IPHC enters into a license with the corporation’s various operating business units related to the use of the intellectual property. The operating business units typically operate in the various states across the country. The IPHC is the intellectual property licensor and the various operating business units are the intellectual property licensees. Transfer price analysts (“analysts”) are often asked to opine on the fair arm’s-length price (“ALP”) for the use license related to the IPHCowned intellectual property. These analysts are asked to quantify the ALP royalty rate that an independent licensor would charge to an independent licensee for the use license of the subject intellectual property. In such instances, analysts typically apply generally accepted intangible property transfer pricing methods in order to determine the fair ALP royalty rate for the subject intellectual property intercompany license. The original version of this discussion was published in the winter 1991 issue of Insights. That original discussion was titled “Determining the Appropriate Transfer Price for Interstate Intangible Asset Transfer Programs.” That Insights discussion was originally authored by Robert F. Reilly, CPA. When a multinational corporation develops and owns intangible property that is transferred to a controlled foreign subsidiary, the transferee should pay an arm’s-length price (“ALP”) for the transferred intangible property. Likewise, when the intercompany use of intangible property is licensed between a controlled foreign entity and a domestic taxpayer, the licensee should pay a fair ALP royalty to the licensor for the use of that intangible property. In addition, when a controlled participant enters into an intercompany cost sharing arrangement, the participant should buy in to the contributed intangible property at an ALP. The purpose of such a transfer price is to ensure that the appropriate amount of taxable income is recognized—and the appropriate amount of income tax is paid—in each national taxing jurisdiction. The intercompany transfer price should reflect the ALP that unrelated parties would agree to for the transfer or use of similar intangible property. For domestic taxpayers, the Treasury Regulations provide guidance on the methods to estimate the ALP in such situations. However, the transfer pricing analyst (“analyst”) is likely to encounter special circumstances in each intercompany transfer engagement. This discussion addresses issues that the analyst may encounter when applying the procedural guidance provided by the Regulations to Internal Revenue Code Section 482. These Regulations encompass the determination of an ALP for the intercompany transfer of tangible property, intangible property, and services. The original version of this discussion was published in the Spring 2012 issue of Insights under the title “Overcoming Obstacles in the Intellectual Property Transfer Price Analysis.” Aaron M. Rotkowski and Scott R. Miller were authors of the original discussion.